Look who’s in a land down under! On Penguin Awareness Day we thought we’d share these NEW photos! 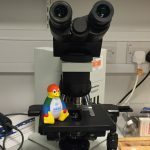 The Pathology department at Darent Valley Hospital asked for some Labcold penguins to help them celebrate National Pathology Week…looks like they got more than they bargained for! Great pictures of Felix – a Labcold penguin loving little person enjoying the NEW Labcold penguins. We think they’re TOO cute not to share!